Before the British copyright act was extended to Ireland in 1801, Irish needs were mainly satisfied by booksellers reprinting English titles – with or without authorisation, as Mary (“Paul”) Pollard, expert on the history of the Dublin book trade observed. This lecture will focus on children’s books issued by James Hoey junior in the late 18th century, which were more than mere reprints. Special attention will be paid to how Hoey adapted the famous 1750 Newbury publication A museum for young gentlemen and ladies specifically for an Irish readership. 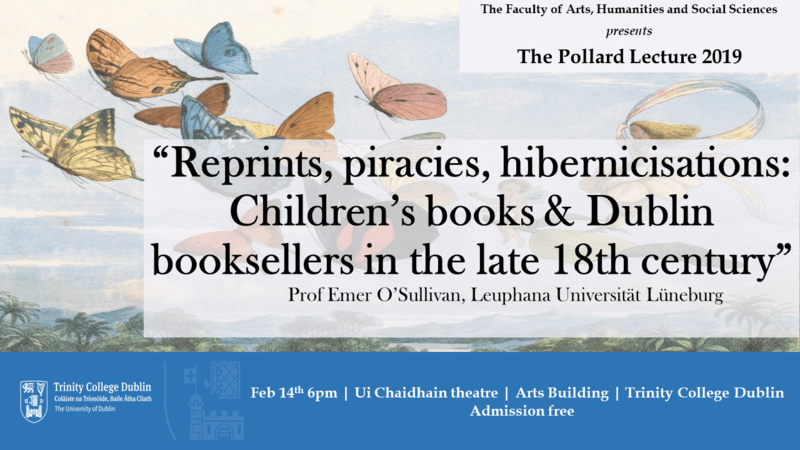 The lecture draws on material from the Pollard Collection at Trinity College, bequeathed by the former Keeper of Early Printed Books, which is the largest collection of children’s books in Ireland. Emer O’Sullivan, Professor of English Literature at Leuphana Universität Lüneburg, Germany, has published widely in German and English on image studies, children’s literature and translation. Kinderliterarische Komparatistik (Winter 2000) won the IRSCL Award for outstanding research in 2001, and Comparative Children’s Literature (Routledge 2005) the Children’s Literature Association 2007 Book Award. Imagining Sameness and Difference in Children’s Literature (co-edited with Andrea Immel) was published by Palgrave Macmillan in 2017. She is currently working on an updated and expanded edition of Historical Dictionary of Children’s Literature (Scarecrow Press). This entry was posted in Early Printed Books, Lecture, News by Admin. Bookmark the permalink.